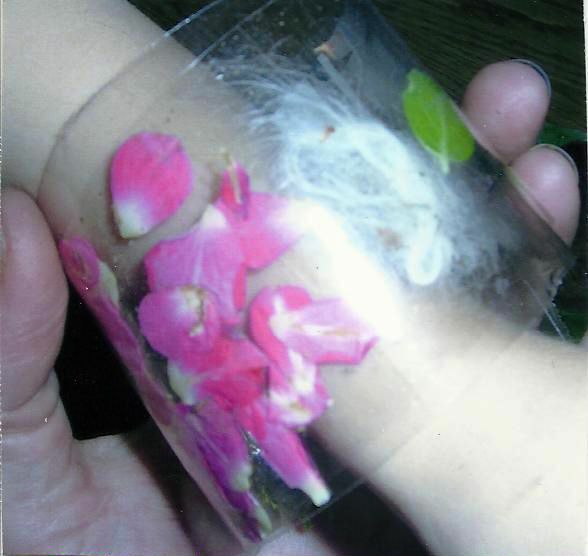 When my daughter was younger, we went on a nature walk, collecting odds and ends from nature in a bag. When we got home, I opened a piece of clear packing tape, sticky side up, and placed it on the table. My daughter stuck some of her nature finds onto the tape, including beautiful flower petals, small leaves, and some white animal fur. I put another piece of packing tape on top, so that the two sticky sides faced each other. Then I wound it around her wrist, trimming it and taping it so that it was a bracelet. She smiled as she wore her nature bracelet all day. When Grandma came over, she showed Grandma her bracelet, too. This entry was posted on Thursday, October 28th, 2010 at 8:14 am	and is filed under Early Childhood. You can follow any responses to this entry through the RSS 2.0 feed. You can skip to the end and leave a response. Pinging is currently not allowed. OMG! This is such a fabulous idea! What a fun little memory recorded! I bet she remembered that nature walk for a long time because of that simple project too.